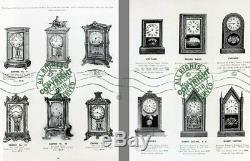 Catalogue Title: 1906 - 1907 Seth Thomas Clock Company Catalogue -- Replica of the original 1907 wholesale samples book. 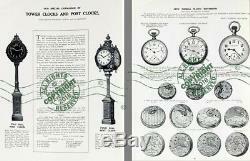 Replica of the original 1907 trade samples catalog of decorative and artful time pieces from alarm clocks to pocket watches. - 82 pages, in new condition. - Replica/reprint published by Portable Trunk Publishers. 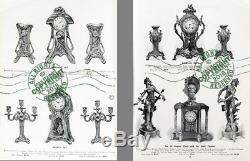 A delightful look at many different clock designs that were popular in the early 20th century. 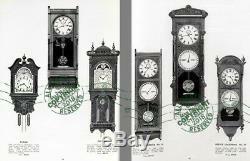 Ideal catalog for collectors, designers, set and prop designers, restorers, or antiques dealers of fine American made clocks and watches. 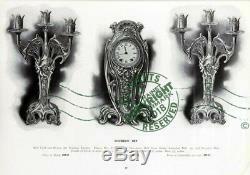 Features all sorts of clocks: Alarm, mantel, wood case and Adamantine finishes, polished cabinet cases, candlesticks, English cabinets, ornate metal sets in the Art Nouveau style, figurative styles, vase and sculptures, candelabra sets, Empire cases, travel clocks, novelty embellished models, vanity models, lever clocks, boat models, ships bell clocks, Gothic styles, office clocks, arts and crafts styles, marble dial clocks, wall clocks, parlor calendar clocks, regulator models, double time models, grandfather clocks, hall models, face variations, street post clocks for outside, tower clock movement systems, and pocket watches. Paper / Soft cover reprint edition in very good condition, flex covers, cloth bound, a sturdy book. Overall good copy, informative resource. It would make a great gift for the fan in your life, even if that's you. 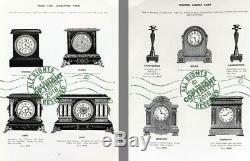 - Reproduced in b/w, same as original issue. Some of the text is small, so it's a little hard to read. 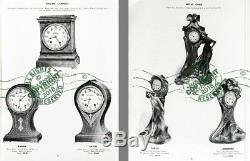 Location: from inventory, Seth Thomas 1907 catalog. From our fantastic collection of rare and out-of-print books. Check our store, we new items regularly. Awesome collectibles for a creative thinker. Delightful books for you to read and enjoy. There's nothing like cozying up to a good book. Thanks for looking at our items. NOT a print on demand (not POD). We sell our books at multiple sites, subject to availability. (This is the actual book seen in our photos). Please note these are low resolution photos / scans of this item(s). Actual item is crisp and detailed unless otherwise noted. We do our best to describe and photo each item we list. We appreciate your contacting us when you have any questions or concerns. We check our messages daily. We hope you'll respect that fact. 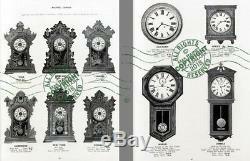 We pride ourselves in offering fast professional service on all of our items. 0 - We do appreciate your patronage very much. Colors may vary due to your monitor. We strive to offer the very best service to our valued clientele. All images displayed are property of Max Rainet and/or Cathy Peterson. I, Max Rainet, guarantee authenticity. All others are fakes, forgeries, imposters or fraudulently used. Thank you for viewing this item. 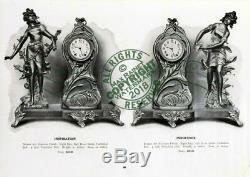 Please view other treasures in our Shop. Friends, followers and customers: THANK YOU and Blessings to you, Max Rainet. 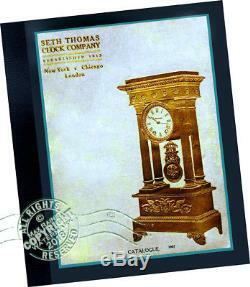 The item "Seth Thomas Clock Co 1907 CATALOG Antique Time Pieces 100s Samples mantel + more" is in sale since Saturday, November 10, 2018. 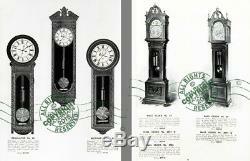 This item is in the category "Collectibles\Clocks\Antique (Pre-1930)\Other Antique Clocks". 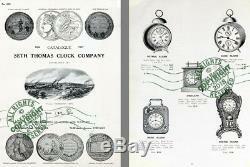 The seller is "max_rainet" and is located in Ventura, California. This item can be shipped worldwide.